Instead of regular alphabetical/numerical sorting, have you ever wanted to establish your own sort order? 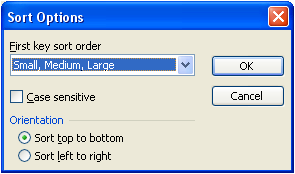 Perhaps to sort by region: West, Central, East (in that order), or by size: Small, Medium, Large (in that order). Custom lists make this a snap. So, what is a custom list? Have you ever typed a month or day in a cell, and then used the fill handle to copy the subsequent months or days in their chronological order? This is possible because the days of the week and months are built-in custom lists. 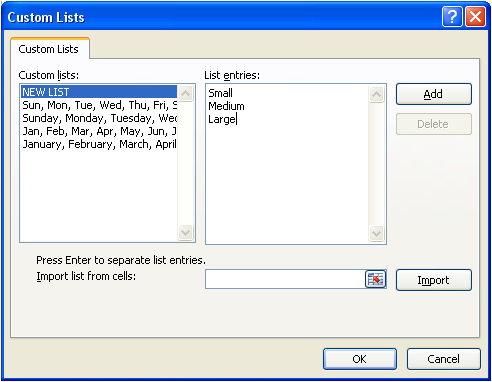 You can create your own lists to enter data quickly using the fill handle. You can also sort in the order of your list, which is explained below. In the Custom Lists dialog box, click NEW LIST, and then type the entries in the List entries: box, typing them in the order by which you wish to sort. Hit Enter after each entry. After the list is complete, click the Add button and then OK. Note: You can also import list entries from a range of cells by typing them in their sort order, selecting them and clicking the Import button. Select any single cell in the data range. 2010 & 2007 Click the Sort & Filter button on the Home tab > Editing group, select Custom Sort, and then select the custom list from the Order drop-down. 2003 Click the Data menu > Sort option > Options button, and then select the custom list from the First key sort order drop-down. © 2012 DJH Training & Application Solutions Inc.
WOULD YOU LIKE TO USE THIS ARTICLE IN YOUR NEWSLETTER, EZINE OR WEB SITE? You can, as long as you include this complete blurb with it: An entrepreneur at heart, Deborah J. Sparks established DJH Training & Application Solutions Inc. over 20 years ago, realizing her dream of creating a company known for providing high quality computer software training, application development and support and exercising her passion for teaching. To learn more and to register for DJH's free newsletter, Innovations, please visit www.djhsolutions.ca. © 2016 DJH Training & Application Solutions Inc.